Maybe you know this about me…I haven’t seen many movies. In fact, most movies made in this century, I’ve only seen because I’ve been on plenty of long plane rides. When the Oscars come around, most years I haven’t seen any of the nominees. Recently, Ida (Best Foreign Film) is the only one I can remember seeing. So it should be unsurprising that I’ve never seen The Godfather. The movie turned forty-five this year and TCM brought it back to the big screen on Sunday (and today! Go if you can!) I knew it would be the perfect way to experience this classic for the first time. I’ve seen quite a few of the Fandango/TCM Big Screen Classics and they are well-done and not widely attended (at least around my neighborhood.) The TCM people do a little introduction and closing with some history of the movie, which is always fascinating and helps put the classic in context. I’m checking out the rest of this year’s line up to see what other parties we can plan–E.T. is coming and I haven’t seen that since the 80s so it will be like seeing it again for the first time! 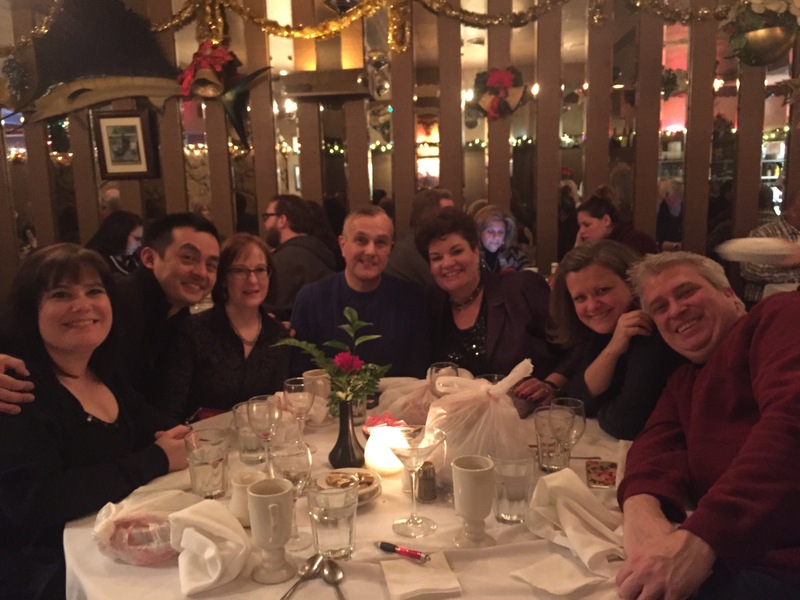 We spent yet another New Year’s Eve at the Golden Steer with our friends. It’s become a tradition that I start looking forward to as soon as I turn the calendar to December. 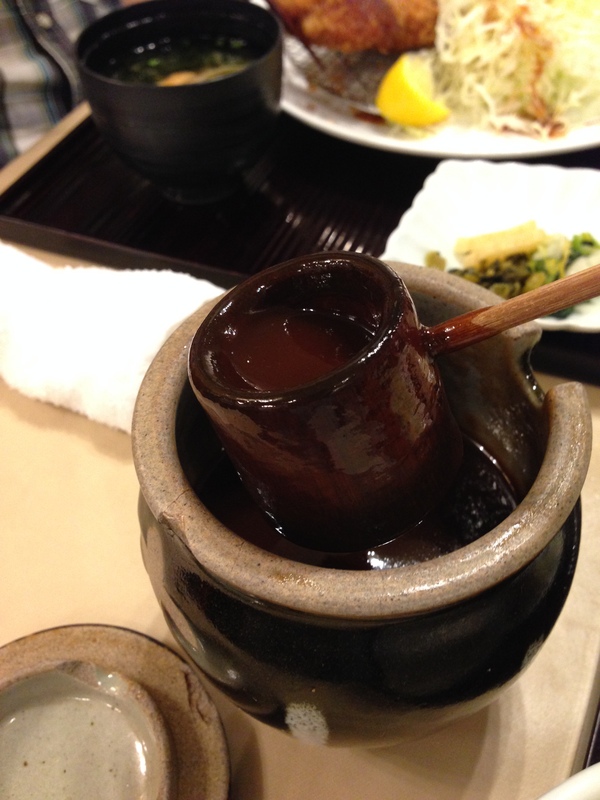 Naoto and I talk about the French Onion soup and the steaks we will order all month. After dinner, everyone came back to our apartment for drinks, snacks, and dessert. 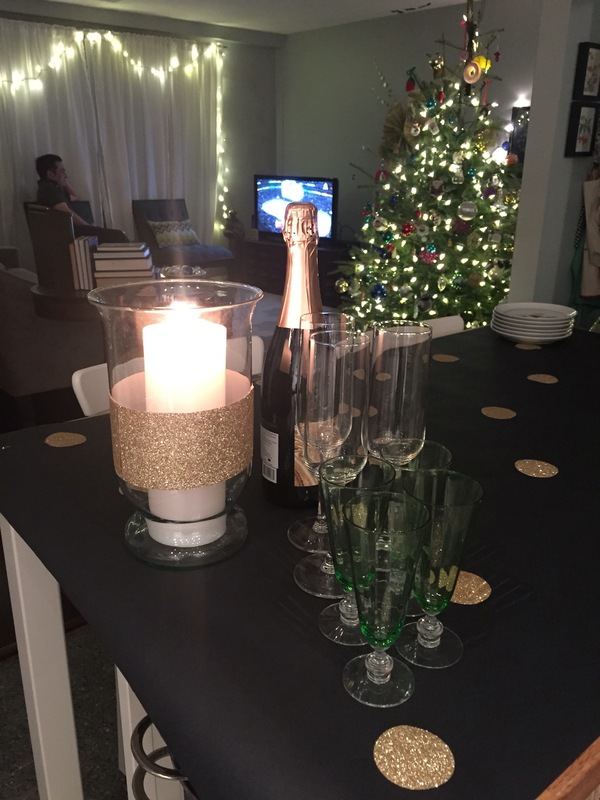 It’s always nice to ring in the new year in the comforts of home and with the laughter of friends. I made a simple cover for our island with the leftover wrapping paper from Phantom Flight Night™. I taped on some glittery dots that I punched out of gold glitter paper from my stash. It was simple and sparkly. New Year’s Day was lazy! 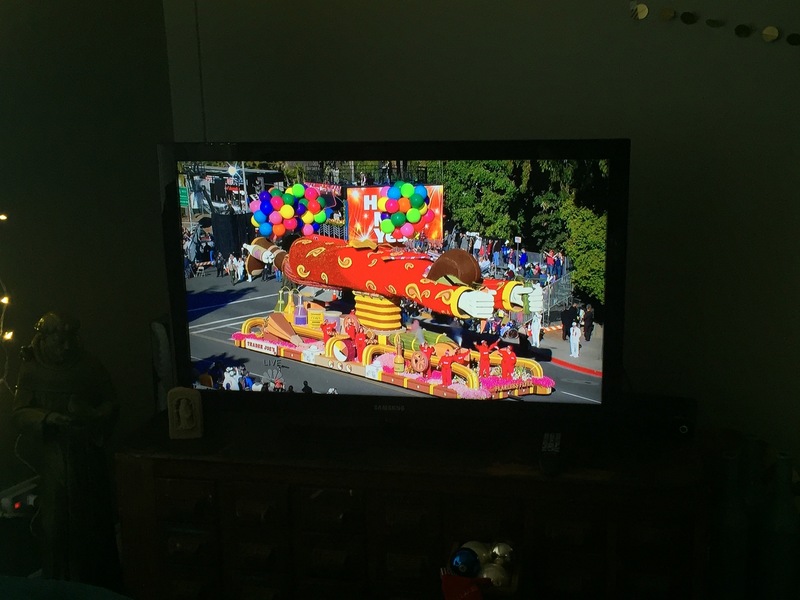 We watched part of the Rose Bowl Parade–I only watch for the Trader Joe’s float, pictured above. It’s always fantastic. 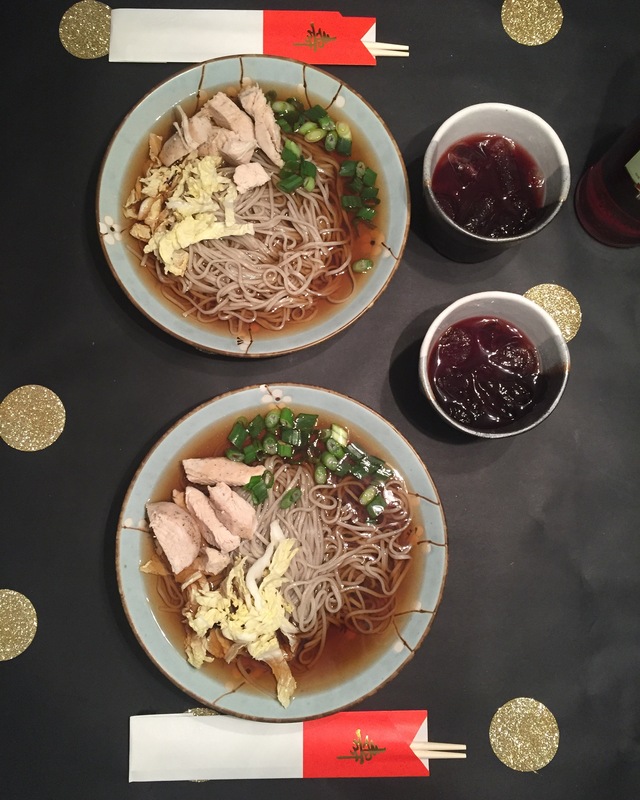 For supper we ate (our version of) toshikoshi soba. In Japan, toshikoshi soba is eaten as the last part of the meal on New Year’s Eve, but since we had dinner plans already*, we decided to eat it on New Year’s Day. We topped our noodles with roasted chicken, scallions, and cabbage, but this recipe has more traditional ideas. And I picked up some special New Year chopsticks last time we were in Japan so it was fun to actually find them in time to use them for New Year’s dinner! *I think next year we should serve the noodles as a close-to midnight snack! 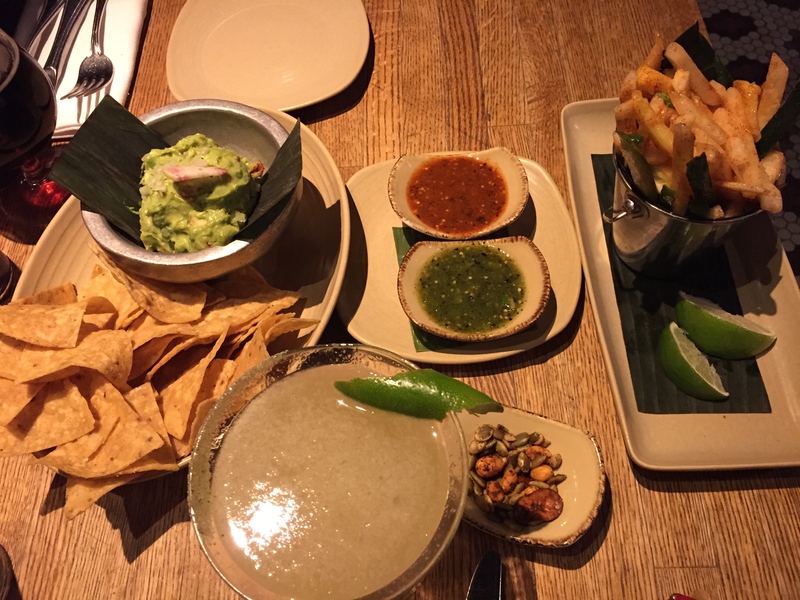 Last month, Naoto and I lived out his dream of eating at Frontera Grill, Rick Bayless’s hard-to-get-into restaurant in Chicago. We made the reservations back in January so by the time March 14th rolled around, I wasn’t the least bit interested in going, especially considering it was St. Patrick’s Parade Day in the city and drunk people were stumbling about. But, we went anyway and didn’t regret it. The food was amazing, the cocktails blew my mind, and the service was impeccable. 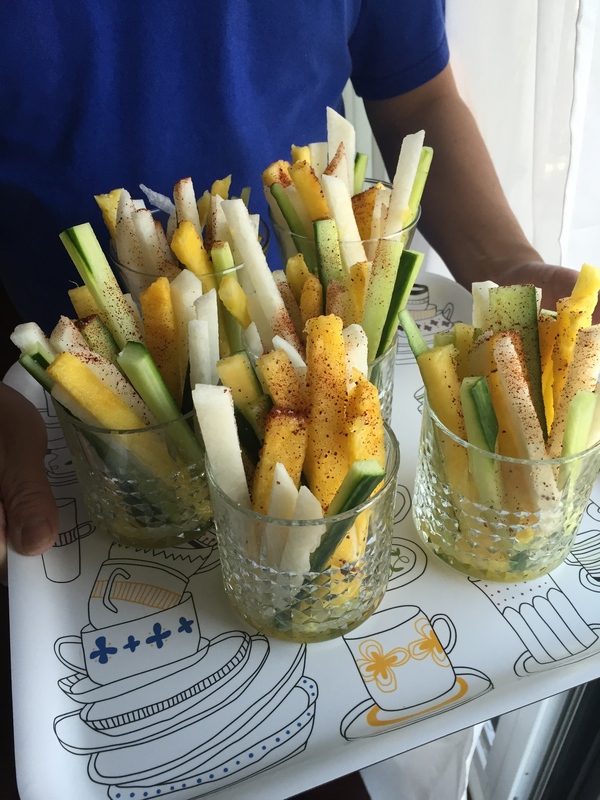 My favorite dish was this Mexican street snack of jicama, cucumber, and pineapple. It’s shown above on the right, along with my tasty Meyer Lemon Margarita and our guacamole. The street snack was so fresh and crisp and juicy…I really could have just eaten a whole meal of it alone. It seemed easy enough to make at home, so on Easter, we tried it out as an appetizer for Easter dinner at Karen’s. 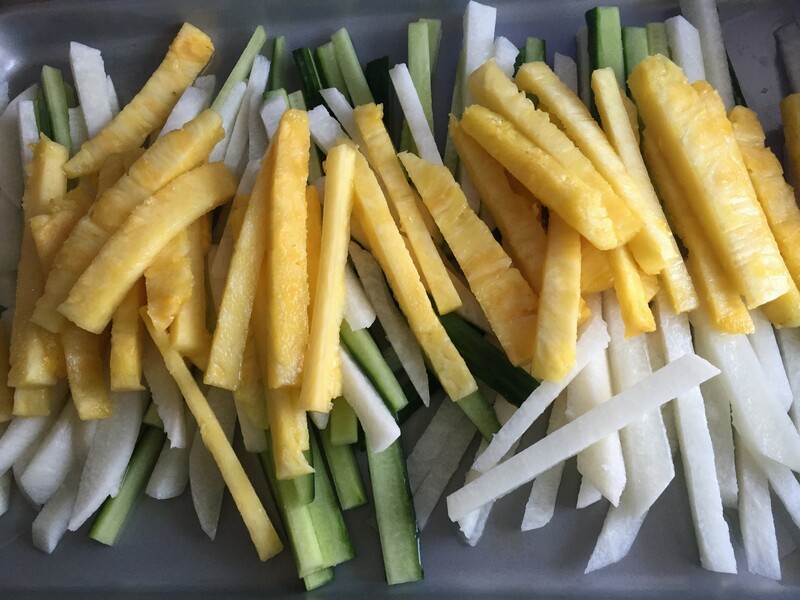 Cut the cucumber, jicama, and pineapple into sticks (like french fries). Place on a large rimmed baking sheet and drizzle with the juice of the four limes. Toss to coat. Sprinkle with chili powder and sea salt and toss again. (Be gentle, the pineapple is fragile!) Serve, standing up in a few glasses. (Old fashioned glasses work nice for sharing, or you could do individual servings in tiny juice glasses.) There should be some leftover juice on the tray. Drizzle it over the prepared servings and sprinkle with a little extra chili powder or Tajín and salt. Serve immediately. 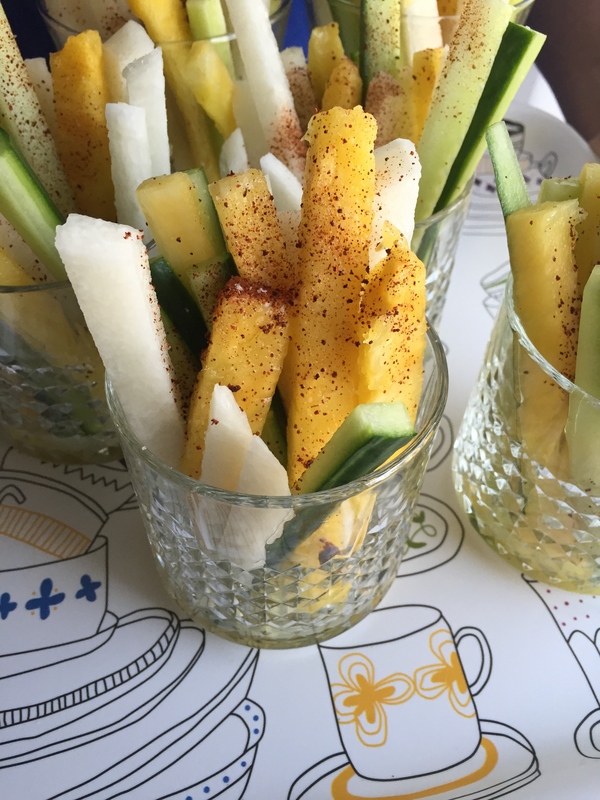 The jicama and the pineapple were by far the most popular, but I think the cucumber adds a savory touch. Plus, all three textures work really well together to make a perfect appetizer or snack. I do believe this is going to make it into the next Hasegawa Happy Hour menu! P.S. Thanks to Naoto for modeling! I’m behind in my ramen reporting! 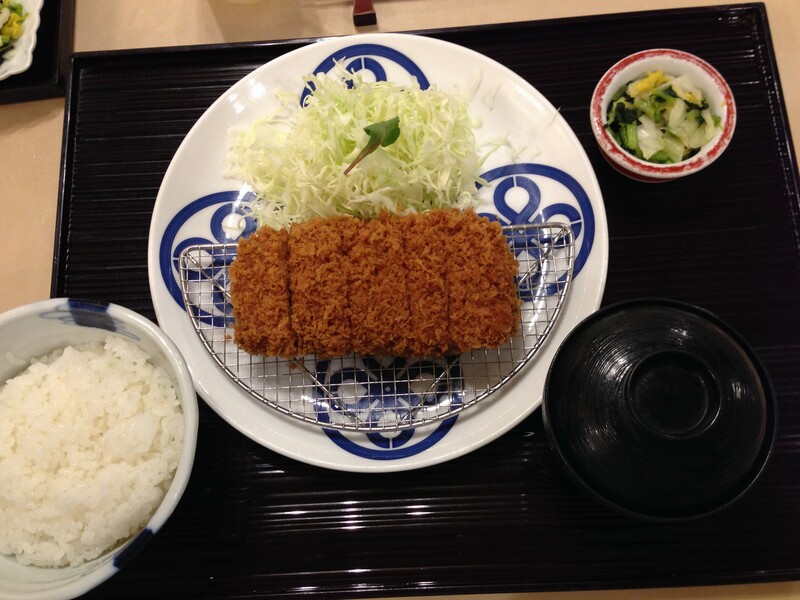 We tried Oiistar back in February, before we went to Furious Spoon. 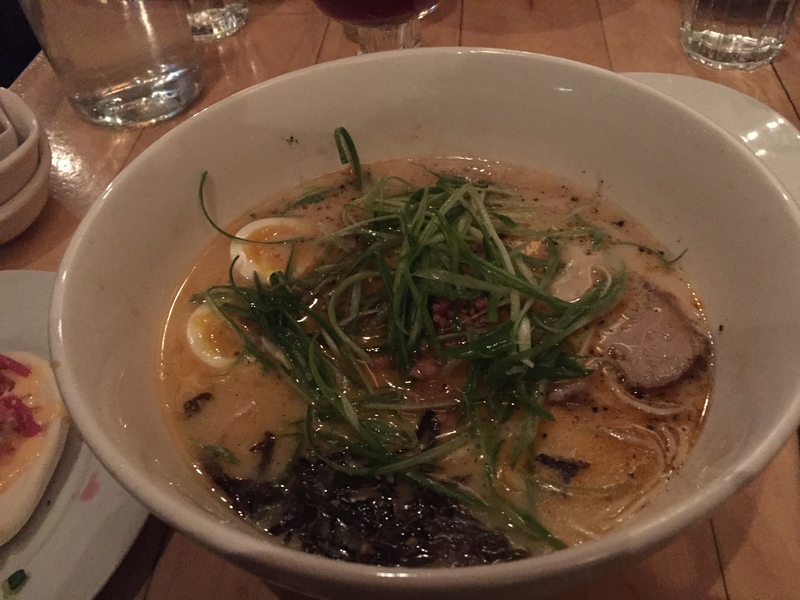 Oiistar gets really good reviews from food writers in Chicago and it’s made it on several “best ramen in Chicago” lists. 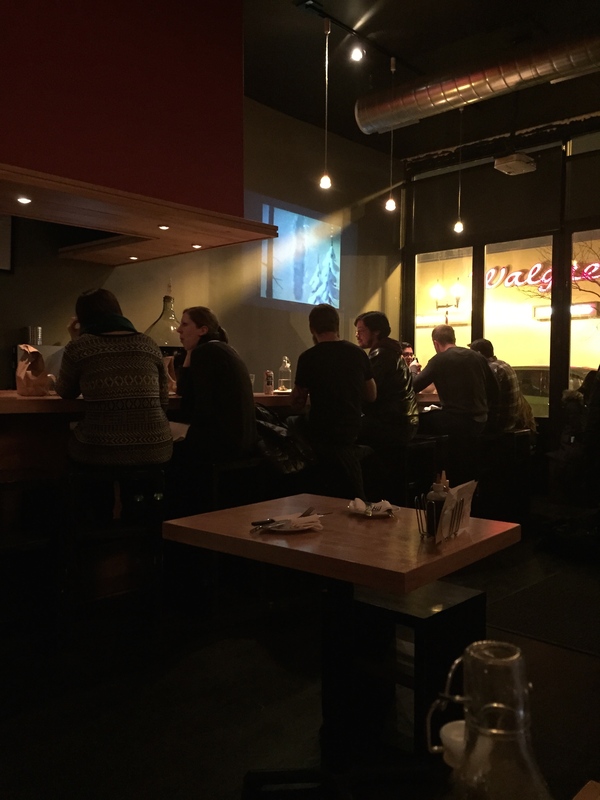 It was the first ramen shop in the Wicker Park/Bucktown neighborhood. It definitely has a “hipster feel” to it, for better or for worse. It’s casual and there are individual tables, a counter, and communal seating to choose from. The owner describes his menu as having French and Italian influences, and you can definitely see that in the menu along with some Chinese and Korean. There are old black & white Looney Tunes cartoons projected onto the wall and the music is old school and loud (but not too loud.) It was freezing and snowy the night we went, so we were both in the mood for a hot bowl of noodles. 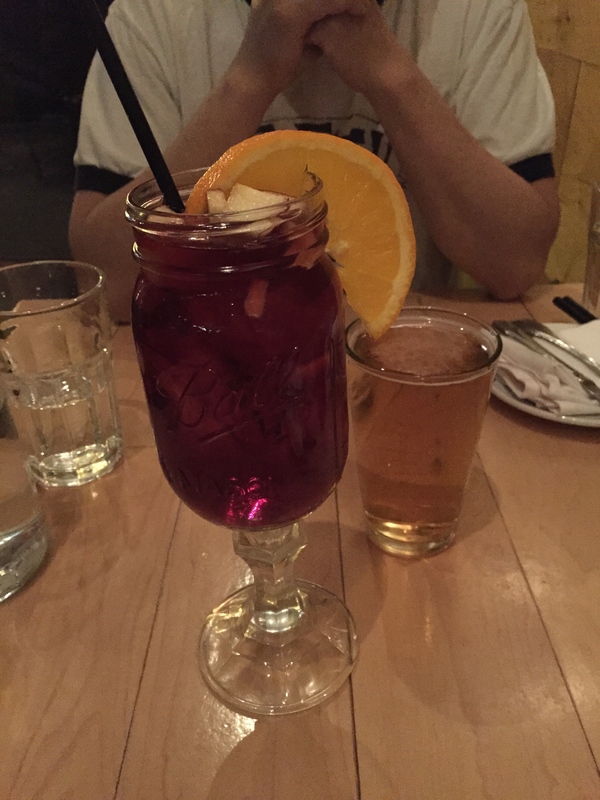 We started with drinks and I will just say this: my review of this restaurant may be unfairly colored by what you are about to see… My drink, the house-made sangria, was served in a mason jar glued to a candlestick. This thing was enormous and clunky and just plain embarrassing. It was so top-heavy that I kept thinking it was going to fall over and spill everywhere. And it stood up so high on the table that it almost blocked my view of Naoto! Everything else in the restaurant was normal…I just have to wonder what in the world the restauranteur was thinking when he chose to serve his (perfectly delicious) sangria in this monstrosity. Okay…back to the food. We ordered buns as appetizers. They arrived at our table with our ramen, which was a huge bummer because it was impossible to enjoy both at the same time, as ramen noodles are best when eaten right away. 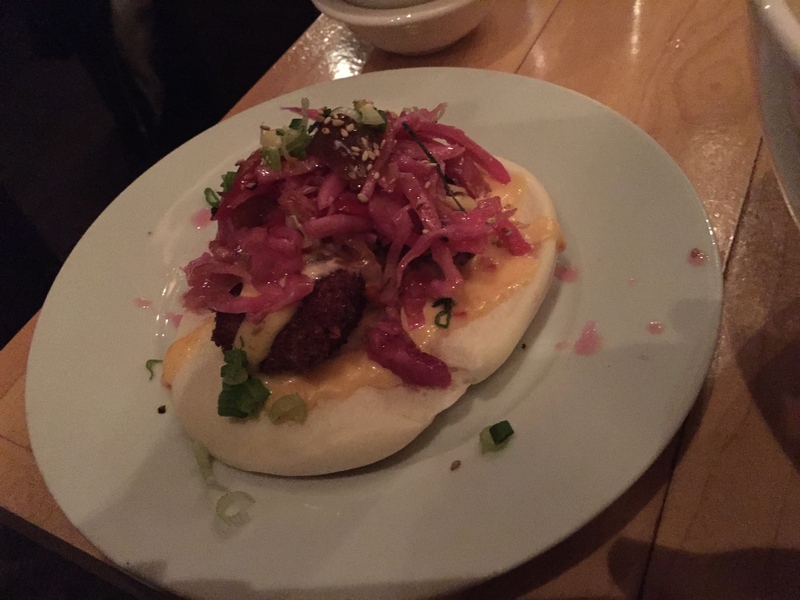 Pictured above is the Tempura Shrimp bun, which is a fried shrimp with chili mayonnaise, fennel slaw, and sesame seeds on a Chinese-style bao bun. It was delicious and something I would order again if we venture back here. For ramen, I got the oiimen (pictured at the top) with pork belly, egg, scallion, mushrooms, spicy oil, and garlic. Naoto got the kimchee ramen. The ramen was solid, but the texture of the noodles didn’t wow me. They are made in-house, which is supposed to be a huge plus. All of the other ramen places we had tried until that point have them shipped in from Sun Noodle. (In the meantime, Furious Spoon opened with their own homemade noodles and, after eating Furious Spoon’s noodles, I think Furious’s noodles are better.) But the flavors and the pork and the soft boiled egg in Oiistar’s ramen were delicious. I would love to go back and try some of their salads and snacks. They offer a bruschetta topped with pickled shrimp, fennel, balsamic and olives that sounds intriguing enough for a repeat visit. I just won’t be ordering another ridiculous sangria.